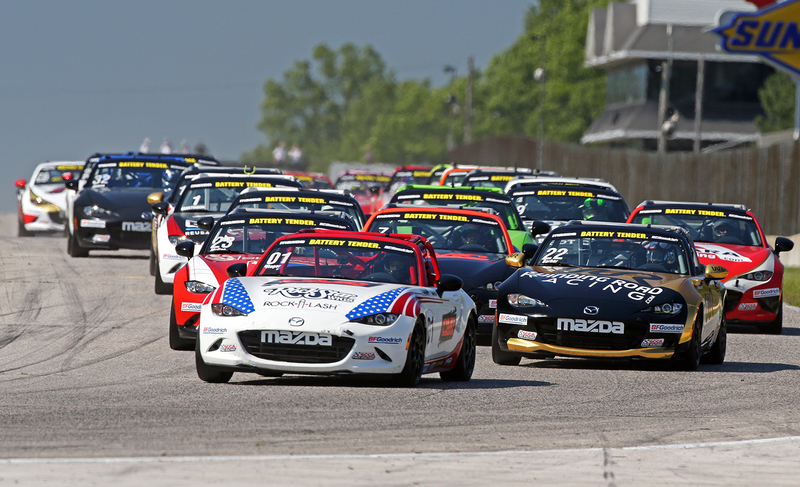 The MX-5 Cup is a very cool series where the winner earns a $200k Scholarship to advance their career. The cars are identical, the motor sealed, and you buy the car directly through Mazda. If only more manufacturer’s offered turn key race cars and well developed series to compete in. So the new cars launched earlier this year with a $53,000 price tag for a brand new, fully assembled race car. The first 108 cars have been purchased at the launch price and and new orders will costs $58,900 which is still a screaming deal for a competitive race car in a competitive series. All you have to do is visit www.MazdaMotorsports.com and drop a deposit. Four to six weeks later a racecar shows up! Here’s the full press release with all the details. IRVINE, Calif. (August 30, 2016) – Mazda Motorsports today announced a number of product enhancements on the Mazda MX-5 Cup race car, which are reflected in a price adjustment for the next production run. Effective September 7, 2016, the price for an MX-5 Global Cup race car will be $58,900, an 11.1-percent increase versus the remarkable $53,000 starting price of the first 108 units built. As a loyalty offer, any of the original 108 MX-5 Cup customers have through Friday, September 16, 2016 to purchase additional cars at the launch price. John Doonan, director of motorsports, Mazda North American Operations (MNAO), said, “When we launched the new MX-5 Cup racecar, our goal was to provide the best value in sports car racing. We believe we have done that,” he said. “With more than 100 orders to date, many others obviously agree. The MX-5 Cup race cars start as complete MX-5 road cars from the Mazda Hiroshima, Japan factory before being transported to engineering development partner Long Road Racing in Statesville, North Carolina where they are produced into a race car. The process includes disassembly of the production car, welding and paint of a full roll cage and interior, and assembly of the race car, adding more than 250 motorsports-specific parts. Other components of the car, including the Mazda SKYACTIV 2.0 liter engine are sealed to ensure even competition and a cost effective platform. ← Previous Post: Toyota Engineers Enter Ojibwe Rally!